This small and secretive bird of shrubby areas is more likely to be heard than seen. The song of the White-eyed Vireo is a powerful, short, jumble of notes that begins and ends with a sharp chik. It is a persistent singer throughout the spring and into late summer. The White-eyed Vireo arrives in Tennessee in early April and remains later than most migrants, departing in mid-October and occasionally staying into November. It breeds across most of the eastern United States and winters around the Gulf Coast, northern Central America, and the Caribbean. Description: This small songbird has white eyes, yellow "spectacles" around the eyes, olive-green upperparts, a white throat, chest, and belly, yellow sides, and two white wingbars. Immature birds have brown and gray eyes (July-February). Sexes are similar in plumage. Voice: The song is a quick sharp series of 5 to 7 notes beginning and ending with emphatic chik. Sometimes described as quick with the beer check. Both males and females will sing this song on the wintering grounds. 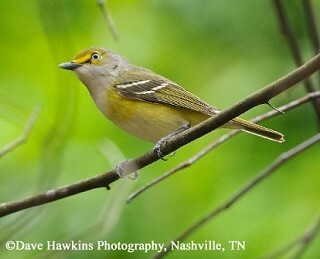 Bell's Vireo, a very rare bird in Tennessee, is similar in appearance but lacks the bright yellow spectacles, is grayer overall, and has dark eyes. Blue-headed Vireos have white spectacles, dark eyes, and a dark gray head. Habitat: Found in deciduous scrub, overgrown pastures, old fields, wood margins, streamside thickets, and mangroves. Nesting and reproduction: Females apparently choose their mates by wandering from territory to territory before they settle on one. Incubation: Both adults incubate the eggs for 12 to 15 days. Fledging: Both parents feed the young, which leave the nest after 9 to 12 days. Nest: Females choose the nest site, and males and females construct the nest together. It is usually suspended from a twig of a small tree or shrub, usually within 8 feet of the ground. The nest is made of fine materials such as mosses, lichens, leaves, and small sticks, and lined with even finer material such as plant down and spider's silk. It is often pointed or tapered at the bottom. Status in Tennessee: The White-eyed Vireo is a common summer resident and migrant at lower elevations across the state. It arrives in early April and departs in mid-October, occasionally staying into early November. This species appears to be declining in Tennessee, likely the result of the loss of brushy habitat and hedgerows in and around farmlands. On the wintering grounds, both the male and the female will sing the quick with the beer check song that the male sings on the breeding grounds. A wing bone of a White-eyed Vireo from the late Pleistocene, approximately 400,000 years ago, was found in Florida. The oldest known White-eyed Vireo in the wild was 7 years 11 months old. Best places to see in Tennessee: The White-eyed Vireo can be found in appropriate habitat in every county of the state. Hopp, S. L., A. Kirby, and C. A. Boone. 1995. White-eyed Vireo (Vireo griseus). The Birds of North America, No. 168 (A. Poole and F. Gill, eds.). The Academy of Natural Sciences, Philadelphia, and The American Ornithologists Union, Washington, D.C.